Winter is upon us again. It’s time to settle down in our comfy chair with our stitching and create our own wonderland through our embroidery. Our cover artist for this issue is our very own Kathy Shaw! Be sure to read Kathy’s biography. 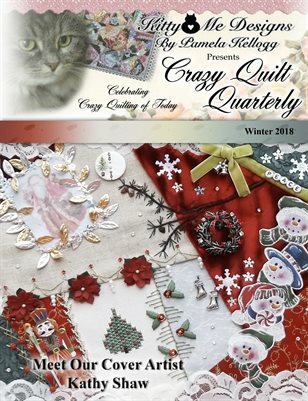 Also in this issue we have a Santa Doll tutorial by Mary Anne Richardson, embroidered coaster ideas by Kathleen McConnell, a wonderful article by Janese Morris about how she created her beautiful crazy quilt and an ornament tutorial by Elisabeth Baty. We’ve included eye candy by Genevieve Tracey, Margreet De Reus, Nina Burnsides, Cris Ruckman and Suzy Quaife. Debbi Oeltjen has provided us with some lovely holiday graphics. Print them on fabric and sew into your blocks! Stitch like crazy this Winter and have a magical Christmas season!! !